A re-release for the Monteverdi 450th, plus Cavalli’s ravishing Requiem and the work long thought to be the ”first” opera, Peri’s Euridice. 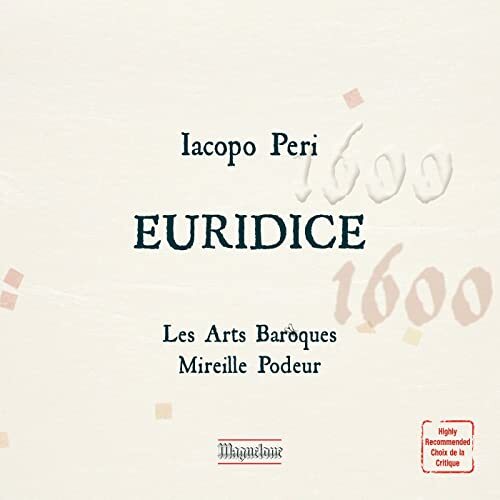 I. Jacopo Peri—Euridice (Les Arts Baroque/Mireille Podeur). Magelone CD MAG 358.415. Born either in Rome or Florence, Jacopo Peri (1561-1633), also known as Zazzerino, was one of the most important figures in the early development of opera. During the 1580s he became involved with a group of intellectuals meeting at the home of Count Bardi in Florence. Known as the Camerata, their discussions included ideas that would have a significant influence on the creation of opera. Primary among these was an attempt to recapture the precepts of Greek drama by employing a kind of rhetorical musical declamation in which music was subservient in importance to a clear exposition of the text. The result was the invention of recitative, the foundation stone, although not the only component, of the earliest operas. The principles of the Camerata are to be found in Dafne (1597-1598), and Euridice (1600), the two earliest operas for which a complete music score survive. Both were composed in collaboration with other composers, a practice familiar from the lavish dramatic Florentine intermedii to which Peri had contributed, and which are a precursor of opera. For Euridice Peri worked with the singer and composer Giulio Caccini, another major figure in the early development of opera, who provided several of Euridice's songs and some choruses. Subsequently both men published their own versions with music totally of their own composition. The subject matter of Euridice was a topic frequently employed in music drama of the period -- the power of music, in this instance the story of Orpheus, the paradigmatic musician poet. It is the power of song alone that enables Orpheus to overcome death by enchanting the underworld into releasing his wife Euridice from its grip. The story, set to a libretto by Ottavio Rinuccini, is one to which Monteverdi would return seven years later to create the first great opera, Orfeo. Euridice builds on Dafne in the respect of demonstrating that a coherent dramatic story could be entirely set to music. The opera opens with a prologue that is followed by five scenes (including one set at the gates of Hell), each of which concludes with a homophonic dance chorus of the type found in the intermedii. In addition to music in recitative style (stile recitativo), there are set pieces, mostly strophic songs of the kind familiar from Orfeo. Euridice was first given at the Pitti Palace in Florence on October 6, 1600, on the occasion of the wedding celebrations of Maria de' Medici and Henry IV of France. The instrumental forces employed include a range of continuo instruments: harpsichord, chittarone, lute, and lyra, with the probable addition of a single melody instrument in the prologue and finale. II. Francesco Cavalli—Requiem (Ensemble Polyharmonique/Alexander Schneider). Raum Klang CD RK 3601. Cavalli - The Requiem is the composer's last sacred work, the requiem he composed for his own funeral. Cavalli’s left a highly detailed will, which not only provides precise requirements for the composer's annual memorial service, but also for the distribution of his lucrative estate. The ensemble polyharmonique is a group of singers and musicians from Germany, Belgium and Europe, directed by the internationally acclaimed counter tenor Alexander Schneider. In the field of historical performance practice the ensemble deals especially with music of the Renaissance and Baroque. The musicians attach great importance to associative lyrics, sound culture and emotional aspects of their interpretations. All of the artists are not only ensemble singers, but established their own reputation as soloists in the international music scene. They bring together their rich experience from cooperation with leading performers of early music and are invited to festivals in Germany, Belgium,Austria,Czech and Slovakia. Especially successful is the ensemble's co-operation with baroque orchestra Solamente Naturali Bratislava and artists such as David Van Bouwel, Klaus Eichhorn, Juliane Laake et al. III. Monteverdi: Il Sesto Libro de Madrigali (Concerto Italiano/Rinaldo Alessandrini)/ Arcana CD A425. Rinaldo Alessandrini is one of today’s most eminent Monteverdi authorities, and his highly acclaimed recordings with Concerto Italiano are now widely recognised as a reference point for music lovers all over the world. Recent achievements include the completion of Monteverdi’s trilogy of operas (directed by Robert Wilson) at La Scala in Milan and at the Opéra National de Paris, and a triumphal concert tour in Australia and New Zealand with the Vespro della Beata Vergine. To mark the 450th anniversary of Claudio Monteverdi’s birth, Arcana is proud to reissue the seminal recording of the Sixth Book of Madrigals performed by Concerto Italiano, which is also one of Arcana’s bestsellers. Rinaldo Alessandrini describes the Sixth Book as the book of separation: permanent in the case of death; temporary in the case of lovers at daybreak. It is the book of poignant expression which culminates in the cycles of lamenti, whose autobiographical character is well known: the successive deaths of Monteverdi’s wife (Claudia Cattaneo) and his favourite singer (Caterina Martinelli). Its density of expression, its ‘italianità’, not exempt from theatricality, by turns luminous and despairing, make it the place where interpretation is the fundamental element, capable of overwhelming our contemporaries. From Gramophone: Monteverdi's Sixth Book of Madrigals is dominated by the sadness of separation, whether final and irrevocable as when caused by death, or ambiguous and gently impassioned like that felt by lovers after intense experiences. Indeed the emotional character of the book is determined by two large-scale madrigal cycles both of which deal with these overpoweringly disturbing aspects of the human condition, the Lagrime d'Amante al Sepolcro dell'Amata (''The lament of a shepherd on the death of his nymph''), and the madrigalesque arrangement of the Lamento d'Arianna, the central musical episode of the otherwise lost opera Arianna, and the piece by which Monteverdi was best known by his contemporaries. The rest of the Sixth Book, here presented complete, is taken up with a number of conventional madrigals, almost a cappella in style, and a number of concertato pieces rather in the manner of the last six madrigals in the Quinto Libro. Indeed, by 1614 the unaccompanied five-voice medium would have been considered somewhat old-fashioned, and in using the later edition of 1620 Rinaldo Alessandrini has been able to add continuo parts to those pieces that were originally printed without them. These additions, performed on a variety of instruments, are just one example of the Concerto Italiano's concern with sumptuous textures, for theirs is an approach in which colour and drama are uppermost. The overall effect is of a mobile and fluid vehicle for a music driven by words; there is much variety of speed within pieces, and a general aesthetic approach that some may consider more appropriate for the music of the nineteenth century than for that of the sixteenth.